Life for Charlotte and the family takes on an anxious note. World War One threatens in the early twentieth century and begins in August 1914. We have some new characters but see many of the old faces, maturing, taking life-changing steps as they move from the security of home to the uncertainties of the wider world and in particular the War. 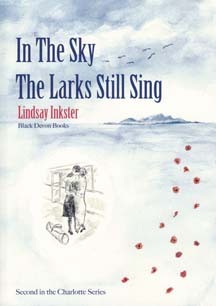 The second in the family saga series about Charlotte and her family, In the Sky the Larks Still Sing shows up the highs and lows, joys and sorrows of life from Shetland and Aberdeenshire to Edinburgh, Glamis and Perth. These contrast with the tribulations of the stench, mud and dangers of the trenches on the Western Front and the noise of battle. There are other tensions, in the battle for lives in the Regimental Aid Post and Wartime hospitals conjured out of castles, hotels, tents, and houses as well as peacetime Infirmaries and the old French Abbey of Royaumont.